Drumroll please. Today is the first user-submitted Salt-Free My Recipe. And isn’t it a beauty! The original dish, sent in by the wonderful CFoung, includes only one ingredient that this sodium girl can’t have: Jade Sichuan Peanut Sauce. But it is this nutty, spicy, creamy condiment that is the true star, if not the heart and soul, of the dish. 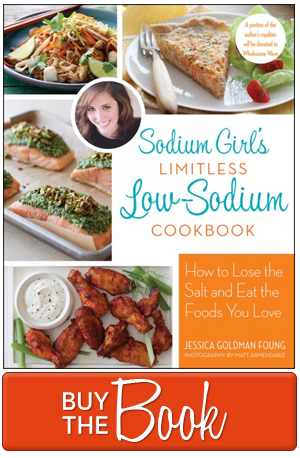 Which poses a perfect low sodium challenge. 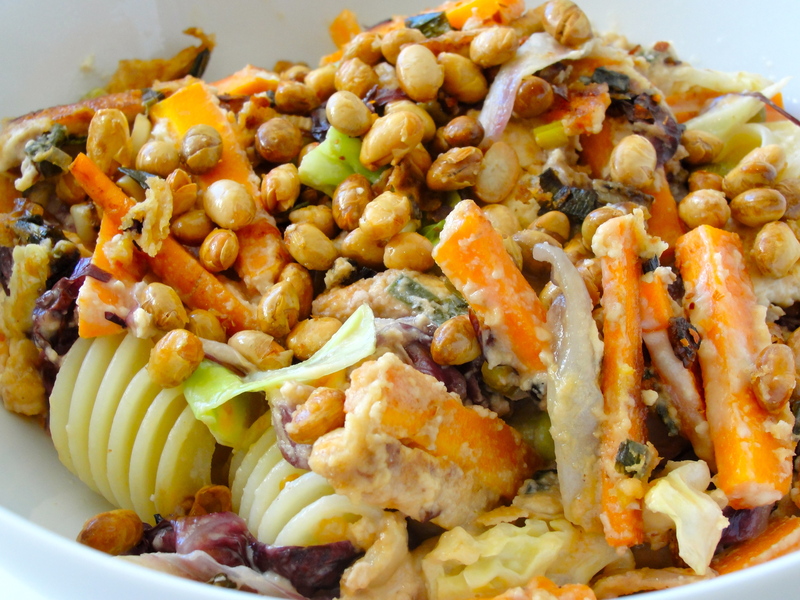 Without the Sichuan Peanut Sauce, you are left with a somewhat boring and sauce-less stir fry. So it was time to put on my cooking cap and come up with a mind-blowing low sodium solution. Now, the good news is that there are several brands of low sodium or salt-free peanut butter available in the market, which, when mixed with other spicy ingredients, will make a satisfying substitution. But just because I like to make things more difficult…I mean, exciting…I not only have to watch out for the salt, but I also have to stay away from nuts. Yes, I’m allergic. So a low sodium peanut butter swap just wouldn’t do and thinking caps had to go back on. As I have been on a recent hummus kick, though, the answer was easy to find. It was actually sitting right in my fridge: Tahini. This thick paste made from sesame seeds has a texture and taste similar to peanuts with out the allergy-inducing oils. 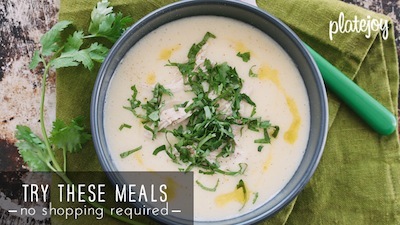 I simply mixed four tablespoons of the tahini with two tablespoon of water, creating a more consistent, silky texture. Then, to give the sauce heat and tang, I added four tablespoons of my favorite Ginger People Sweet Ginger Chili Sauce. And voila, a peanut and salt-free spicy, nut sauce. As a bonus Sodium Girl trick, I swapped soy nuts for the peanuts and toasted them quickly in a saute pan over medium heat. These little nut-free nuggets provided the perfect crunchy topping to finish the dish. So with that my fiery friends, may I present to you a Sodium-Free (and Nut-Free) version of Timbo Joe’s Peanutty Pasta Deliciousity. Chow on. 1. Julian all veggies and tofu, making them the same length as your noodles. 2. Add the sesame oil to a large saute pan or a wok and heat over medium-high flame. You want to be sure that there is enough room for all of your vegetables to sit comfortably and not be crowded. 3. 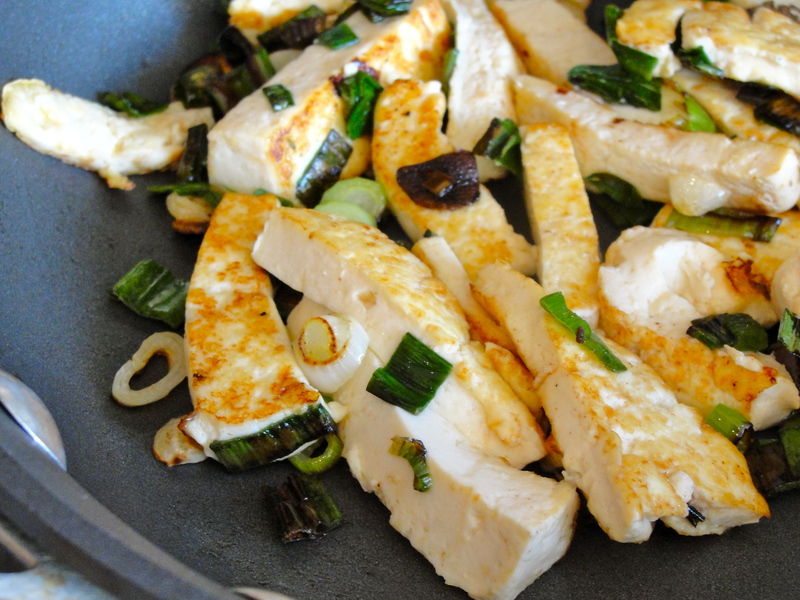 When oil is spitting and ready, add the tofu to the pan and allow it to brown, approximately 5 minutes each side. 4. While tofu cooks, prepare a pot of boiling water for your pasta. As soon as it starts rumbling, add your noodles and cook accordingly. 4. 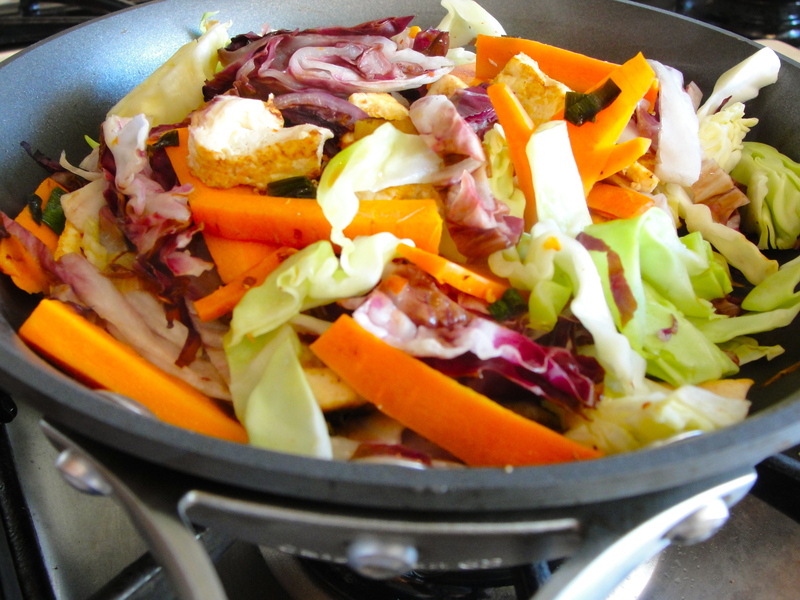 Begin to add your veggies to the saute pan or wok: start with the carrots and allow to cook for 2 to 5 minutes; then add radicchio and cabbage, another 2 to 5 minutes; and just before your pasta is ready, add the green onions. 5. Strain the cooked pasta and allow to cool. 6. 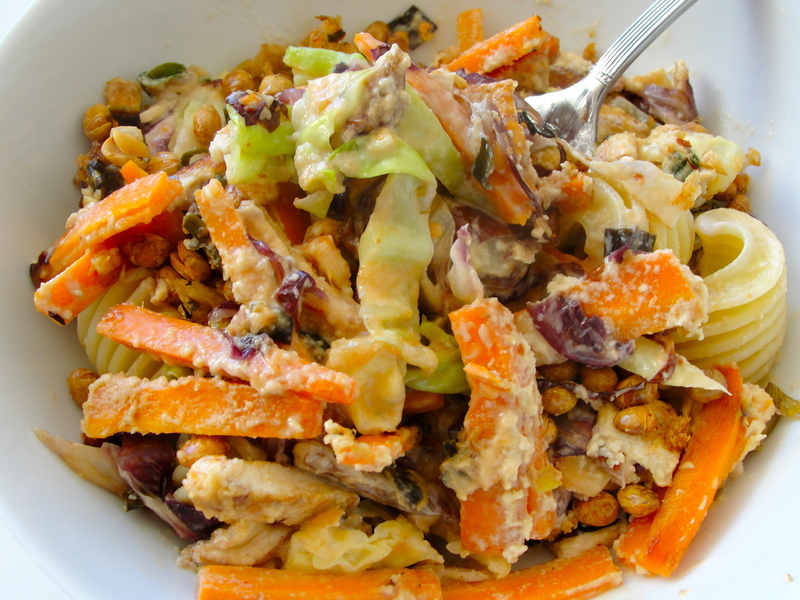 In a small mixing bowl, combine the tahini and water until it is silky smooth. Add the Sweet Ginger Chili Sauce. 7. Add the noodles, sauce, garlic powder and chili flakes to the saute pan or wok and gently mix all the ingredients. 8. Spoon the pasta into bowls and then quickly heat your peanuts or soy nuts in the saute pan over medium-high heat for 1 to 2 minutes. Sprinkle on top of pasta and serve. I need to start reading your blog after lunch, because it always makes me so hungry! Yum! Hooray! It looks AMAZING! 🙂 Can’t wait to try it out. Wow! Super impressive, this sounds (and looks!) deeelish. I have been trying to eat low sodium but it was hard because it lacked so much flavor. Until I tried this recipe it was amazing how much flavor it had, really great dish and made me think why must we add so much salt to things to get flavor when you can do it with so little. Really glad I found your site and look forward to trying more of your recipes. Thank you, Bill, and I am so glad you found my site as well. And of course, that you liked the recipe. My palate really likes spice, so I am always curious how the flavors fare with other eaters. Please feel free to send me any questions regarding low sodium substitutions and to pass this website on to family and friends. We could all stand to cut out salt – even if your health doesn’t require you to! I’m glad I found this site.Have you heard of this peanut butter sub called “PB 2”? It is very low-fat,no added sodium and it tastes quite good.Google it.